(15apr01) This issue gives some thoughts about choosing a boat. Next issue, 1may01, will rerun the essay about joining plywood sheets. If there is one bit of advice I can give to the potential boat builder (or buyer) it is to always choose a boat for yourself, not for your family or your friends. Sound pretty selfish?? From my personal boat experience and especially from seeing many many boats at marinas I can tell you that no matter what the boat's size or style, about half of the boats in use have solo skippers and maybe a quarter have one extra crew member. The big boats at the marinas often, usually, couldn't go out because their skippers couldn't find enough crew. At one marina we had a group of a few dozen oldsters who all had their own big boats. They went sailing every Wednesday, but not each in his own boat. By grouping three or four in a boat they could all go sailing but of course only a fraction of their boats got wet. And if they hadn't been so organized their boats would have seen even less use. We also had a lot of "family" boats in the harbor but I suppose on a good summer weekend about 10% of them actually went out with the family. Here's the deal - not too many folks really want to experience tough yohoho sailing or challenging the elements in the way we see in the magazines. And when you choose a design to build you shouldn't have in mind one of those "charter in paradise" dreams. If you do and get a big sailboat with room to sleep six and standing headroom, etc. I'd say there is at least 90% chance that after the first year (month) you will not be using the boat regularly because you can't find a minimum crew. Yes, there are exceptions. Not only will you end up with a boat you can't use but you might put a lot of pressure on loved ones who really don't want to be a regular part of that scene. I don't see how anyone has a right to force folks to be avid boaters. So here is how I think you should approach the problem. Always choose a boat so you can use it by yourself and in the way you want to use it. Give some thought to getting a boat that matches your local waters. There was a racing sailboat at the harbor at Carlyle lake with an 11' draft. At the best of times half the lake was too shallow for it. If we had a dry spell it couldn't leave its slip. Canoes are good in swamps and creeks with no current, bad in big open water. 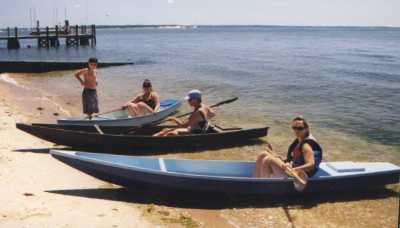 A good rowboat or kayak (with practice) can go into bigger waters and for long distance if it ain't too windy. 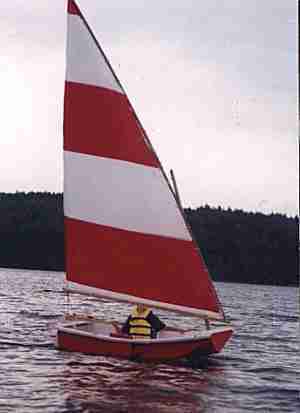 Small sailboats are mostly for open lakes and inlets, useless in a river with current. Rivers with current usually mean a powerboat or a one way trip (downstream). 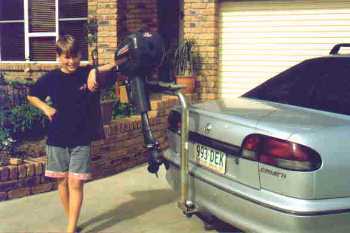 Little boats like Tween shown below can have their advantages. Tween weighs about 60 pounds and is easily cartopped and manhandled by one man. You can row two in it but sailing two adults is probably not a good idea. However if you want to sail two adults once or twice a year you can get away with it. These are cheap easy projects, very good for beginners. I always encourage a new builder to get started with a smaller project. You can practice with techniques and materials you might want for your larger dream. The small first project will almost never be wasted - even after you go to a larger boat you will use the tiny one again and again. 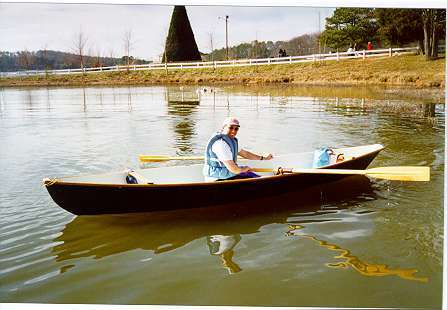 About in the same level of effort and cost are small canoes like Toto shown below. But the boating in a canoe can be a lot different. Toto will paddle (some training required) perhaps 30% faster than Tween will row (or faster) and might be more seaworthy. But it will be wetter and you will need to be more nimble to use it. You couldn't use it as a dink for a large boat because you can't climb into it safely from a larger boat, you seldom can take anyone large with you, and there is little room for the dog and groceries. I haven't designed any elaborate kayaks because there are already so many good ones out there. They can be very fast and seaworthy in the right hands but I'm pretty sure it takes real training to develop the right hands. Me, I'm a poor swimmer and never had the desire to learn how to roll a capsized kayak, nor the desire to be trapped underneath one. So I kept my Toto open so I could fall out of it if it went over (which it has never done with me at the paddle). Remember: any small open boat is useless when swamped - you can't rescue the boat without help. Stay close to shore. 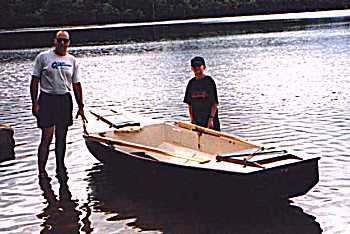 Let's now move up to a larger boat like the 11' Piccup Pram shown here with Vin Mansolillo and son. This boat is easily used solo and yet will easily handle Vin and son on a regular basis. Two big adults would max it out. Piccup stripped will weigh about 90 pounds and that is about the most you can cartop with any ease. You lift it to the cartop one end at a time so you never lift more than about 50 pounds. It's sort of interesting that when I draw something like this I have the weight limit always in mind and it seems like the customers seldom have that in mind. If you overbuilt a boat like this and add say 50 pounds (easy to do) I think you have negated the main reason for building it - weight light enough to cartop easily. 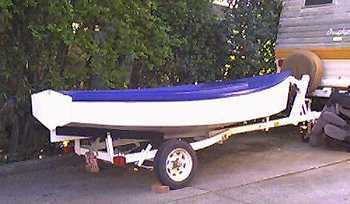 I've done quite a few boats in this size, all about 100 pounds stripped. It usually takes about four sheets of 1/4" plywood to make one this size, about twice the effort of the Tween or Toto, but this is a lot more boat. In fact to me this is a much more useful boat than the dink and I would only suggest a dink to someone with a problem storing a 12' boat. And boats like this have serious emergency flotation boxes which double as storage (provided the hatches are small and don't leak much) and self rescue is possible. It's a stretch to do a small power boat like this. The boat can be made light enough, I think, but where to put the motor with its fuel, smells and leaks while you cartop the hull? In the trunk? Reader Ross Lillistone sent me a photo of how he does it in Australia. He mounts the motor on a standard bicycle carrier that attaches to the bumper. It looks like it works well, at least in a country with no thieves. Clearly not meant for big horsepower but neither is the little boat on the cartop. 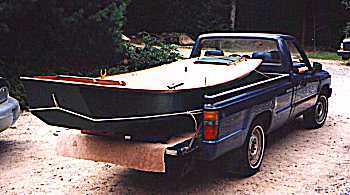 I've carried boats over 15' long in my short bed truck although that is pushing the envelope. Here is the 20' AF2. Most likely it can take another adult or two compared to the smaller AF3. It takes fourteen sheets of plywood compared to AF3's eight. It can still be operated totally by one person with one warning. Smaller boats like AF3 can be recovered from a capsize when the solo skipper puts his weight on the leeboard. We don't know yet if the AF2 will do so. Somewhere in this size and weight range for a 20' boat the skipper's weight won't be sufficient to bring the capsized boat upright and that is why an unballasted boat in this size range can be a bit risky. One solution has been to use the Bolger Birdwatcher system where the sides of the boat are built high and everyone including the skipper sits inside. The high sides make for great righting buoyancy and the crew weight down low on the bottom makes for a low cg to aid in righting. Plus the bottoms of these boats are usually heavily built to add to the ballast effect. These boats have proven to be self righting without ballast. Below is my own interpretation of this type, the Jewelbox. I don't design much over 20' anymore except as a specialty. My advice to anyone who wants a conventional boat over 20' long is to look hard at the used factory boat market. Unless you like wild daysailing and have lots of friends who like going fast and getting wet, any sailboat in this range should be ballasted. There have been so many good designs in this range built in fiberglass factories over the past decades that good used ones can be available for a song. Cherry Catalina 22's can sell for $5000 or less, complete with trailer and motor. You could never build anything like it for that. A lot of these boats were sold in the boating boom twenty years ago, used a few times and then placed in storage. Inspite of what you may have read in Wooden Boat, fiberglass boats aren't really effected by weather and usually these oldies only need maybe some new cushions and a scrubbing. The sun chalked surface is usually a cosmetic thing. I do think there are two good reasons to build a boat in this range - reasons the production builders didn't really address. First is very shallow draft. The production boats that I can think of that featured really shallow draft might be the "Hen" series from Florida and Eddy and Duff's Shearwater and Dovekie. Some of the others feature fairly shallow draft but I can assure you that a boat that draws 6" of water is more versatile that one that draws 16" of water, at least where I live. The second reason to build a boat in this range is for ease of stepping the sail rig to make it a true solo trailer boat. 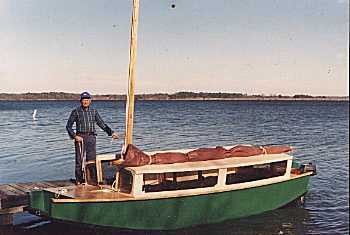 Here again the Hen and Eddy and Duff boats are the only two I can think of offhand that also meet this requirement. 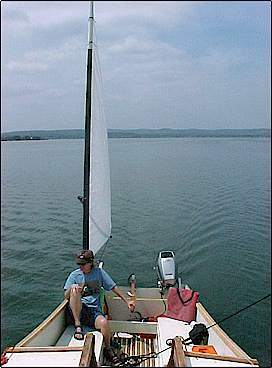 Some of the common trailer sailers like the McGregors actually have light stayed masts which look doable by a solo skipper, but the Catalina is not. I know the vendors of production boats would say something like, "you can rig the boat in an hour on the trailer. Isn't that great!" The answer is no. If you can't pull your boat off the highway and be sailing in 15 minutes you will miss any chance of impulse sailing with it. You will end up in an entire different kind of boating, either stuck with busy weekends or keeping your boat at a marina. 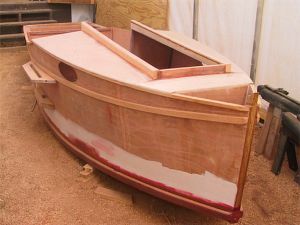 I've only had one boat in this range get built so far, Pete James' 24' Petesboat. Here is a photo of it in the background with brother Karl James' 19' Jewelbox in the foreground. 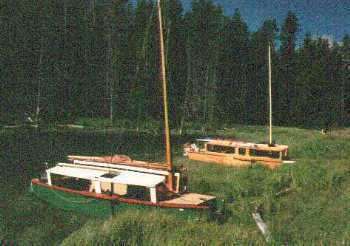 You can see the advantages of these camping boats - pulled all the way up on shore so the the crew steps dry shod and the sail rigs dropped and stowed, but ready to go again at a minutes notice. There are no production boats like these. Once you've decided how large a boat is needed, you will get into details like hull shape. In general the flat bottomed boats are the roomiest and the easiest to build. The more complex shapes, such as the multichine Piccup, are only slightly harder and more expensive to build and you shouldn't be afraid of them for those reasons. They are almost always better in rough water and often significantly better. They aren't as roomy. I know of no successful dual function power/rowing or power/paddling boats. The large deep stern needed by a power boat is death to a good rowing or paddle boat. If you think you are going to use a motor regularly then go with a straight power boat. Any good electric power system will be as expensive as and be a lot heavier than a gasoline motor and will have a much more limited range. But they are excellent for limited waters and where total quiet is required or desired. Motors and small sailboats don't get along too well because there is seldom room for a good motor installation on the stern (plus things can get tangled there). This is a very difficult problem that needs more study because using a straight sailboat can require a huge amount of patience. 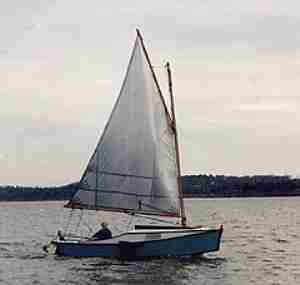 Remember that working sail disappeared as soon as reliable motors were invented. (When you watch the National Geographic TV shows you can see aboriginals in genuine dug out canoes zipping up and down with new large outboards on the sterns.) Almost any cabin sailboat you see is really a motor/sailer. The sails are for recreation and the motor actually gets you where you want to go. 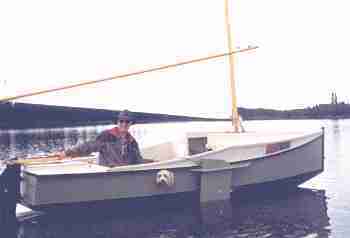 Bolger has always argued that people who want large sail boats would be better off with a good large powerboat towing a good racing dinghy. I'll rerun the essay about joining plywood sheets. Plans for Vector are $20 until one is built and tested. Joe and Dan build Jon Jr.